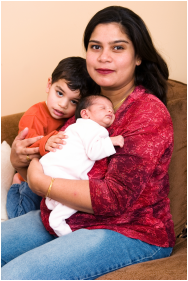 ​Mammas is a Breastfeeding Support Project for Highfields, Leicester. Traditionally, new mums would be helped with breastfeeding their baby by other, more experienced, local women. Peer Support is a way to make sure new mothers can get the help they need to breastfeed, from local women from their own community, who understand their lifestyle and culture, as well as all their concerns about being a new mum. They have time to sit and listen, and to offer encouragement and support. They are able to give accurate, balanced information, which reflects what really works. ​Mammas are all volunteers, and are happy to offer our time to help new mums who are learning what it’s like being responsible for a tiny baby! We come from many backgrounds, cultures, faiths and nationalities. We speak over 20 languages between us and can also offer BSL (British Sign Language). We have many babies and children between us, of all ages. All of our babies came with their own unique personality, needs and challenges. We liaise with midwives, Health Visitors, Surestart and Community Centres across Highfields – we all want to work together to make sure every new mum gets the help she needs.